Race 1 GTM Vosselaar - De website van onroad-electro! The first nats took place on 29/2 at the GTM club in Vosselare, It was a medium size temporary track with some technical layout. In the modified class it was Olivier Bultynck that was the man to beat from the start with his awesomatix winning every round of qualifying. 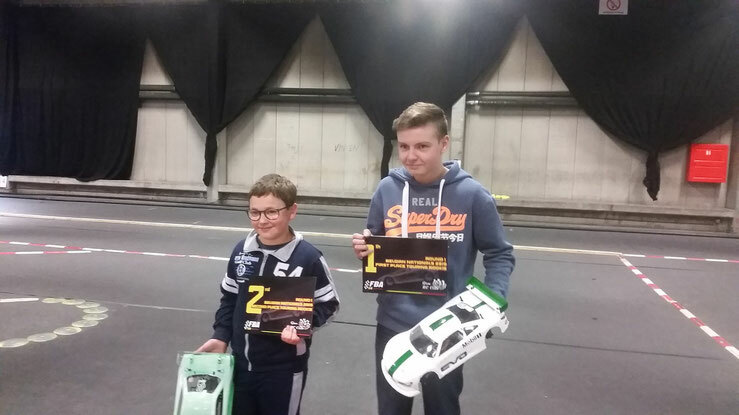 On second place it was youngster Mitchel Van Ess driving his new VBC chassis for the first time that was trying to follow the pace of Olivier followed by Thomas Stockman. This was also the end result for qualifying. Michel and Thomas were in a battle for second place till the end. 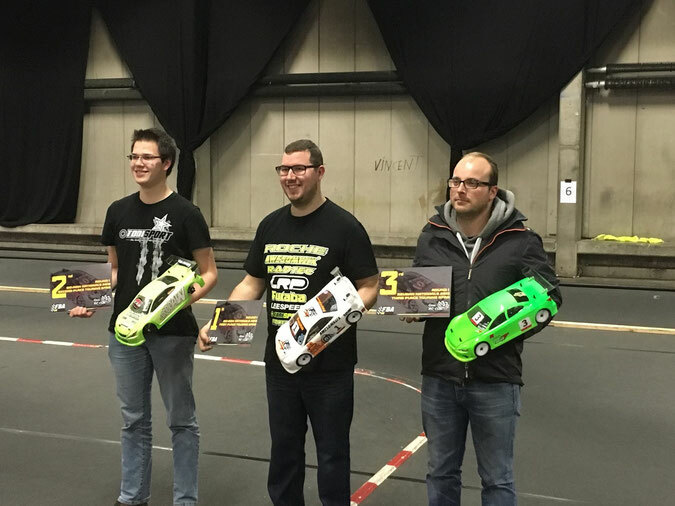 In the last minute Thomas made some small driver errors wich gave Mitchel some space to take second place followed by Thomas. Second final we saw Olivier in lap 5 suffered a body tuck and had to take 2 pits stop so his dad could put the body right in a blistering speed. This way Mitchel and Thomas could pass olivier, Mitchel and Thomad where fighting for first place until Thomas rolled his car coming on the straight. This gave Michel some breathing space but Olivier was fighting hard to come back. In the last minute Olivier was right on Mitchel his tail. Mitchel was trying hard to block Olivier but had to let Olivier pas and secure his second place. This was also the end results of the race 1st Olivier Bultynck (awesomatix) 2nd Mitchel Van Ess ( VBC) 3rd Thomas Stockman (Yokomo). 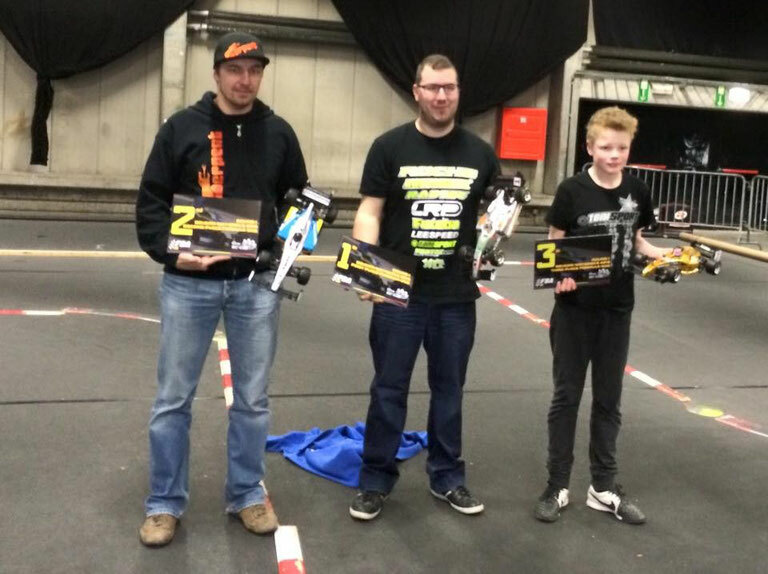 In the stock classe qualifing was close, Florian Joos was able to take TQ in round one and to followd by Rico Claeys and Athan De Witte. Third qualifier we saw how Rico who made the switch from mod to stock take the TQ followed by Florian and Christophe Charlier. First race we saw Rico drive from start to finish on P1 with Florian trying to follow and Christophe follow Florian. Meanwhile Athan was trying hard to come back from P10 after a race incident in the start and just run out of time to overtake Christophe in the end. In the second final Rico again was leading the race, meanwile it where the youngsters batteling it out, Athan quickly overtook Christophe and was pushing hard to overtake Florian. Athan showed great sportmanship after he touched Florian and waited for Florian to recover. This way it was possible for Christophe to catch the youngsters. While pushing hard trying to overtake Florian Athan rolled his car so Christophe was on Florian his tail. In the fight for the lead Florian defended agressively and touched Christophe wich made it possible for Athan to pass and win the race. Followed by Florian and Dirk De Ceumaerde, Christophe was not able to end his race. In the f1 class wich was the biggest class with 18 drivers at the start it was again Olivier Bultynck who was super quick and leading the pack with Steve Deblaere and Florian Joos trying to follow. First race Olivier that was able to pull away for the rest from the start. Steve and Florian did their best to follow but this was no easy task, round by round Olivier was pulling away with a bigger and bigger lead with Steve doing his best to follow. 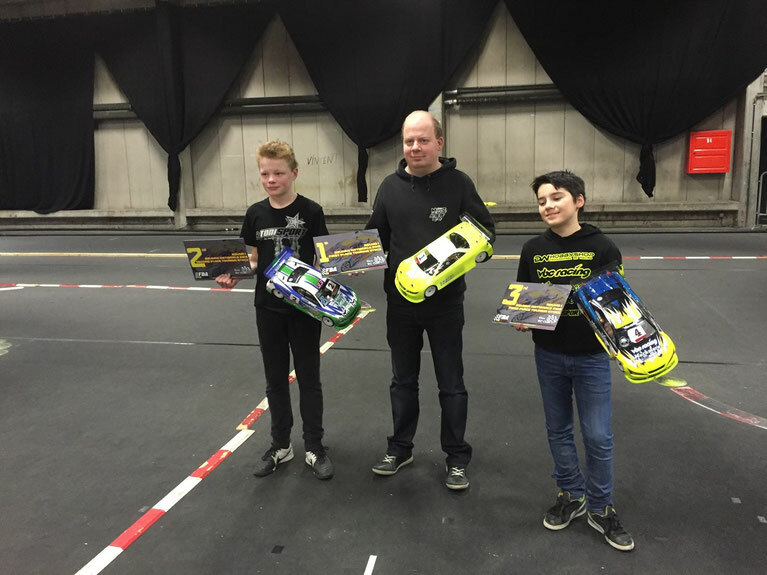 Also youngster Florian did his best to try to follow Steve for second place but made a error in round 12 with made it possible for Frans Engelen to be right at his tail but did not find the a way to pass Florian. Second race it was oli that again was pulling away from the start. Steve had trouble with a slipping diff at the start and saw several drivers pass him. Florian and Nicolas where battling for second place. Nicolas Delise was able to pas Florian after he rolled his car. Steve was pushing hard to recover from his bad start, in the last minut he was catching up to Florian. In his charge for the second place they touched and waited for florian to recover. The last lap Steve again did al he could but at the end was not able to make it stick. In the third race was somewhat a copy from race one with Olivier leading the pack with a clean run from number 1,2 and 3. For the rookie class there was a small change in the rules for this year. Now it is possible for beginning drivers and senior drivers that still want to race but find that the stock class is getting to fast they can join the rookie class. To stimulate the young drivers there is only a podium for the junior drivers (younger than 16) . After the first race we can call this a succes, It’s very nice to see beginning and young drivers battling it out with more experienced drivers. This will for sure help the juniors to learn to drive the ideal lines and learn how to drive in a race and show sportsmanship.